In part one of our change of EuroLeague Women rosters, we mentioned the injury of Lauren Jackson. 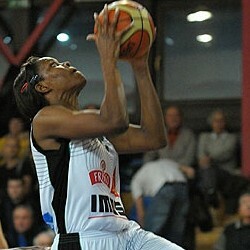 Sparta&K Moscow Region Vidnoje announced that Taj McWilliams (in picture) has been signed to replace her. McWilliams who is now 40 years old started the season on a short-term medical replacement contract with Ros Casares. Last season she played in the Czech Republic with Gambrinus Sika Brno and represented the Rest of the World Team at the EuroLeague All Star Game. McWilliams played for Spartak Moscow during the 2006-2007. Sparta&K Moscow will also be without Latvian international Anete Jekabsone-Zogota who was released from her contract and has signed for Turkish club side Fenerbahçe. It appears that Penny Taylor has left Fenerbahçe. Ljubica Drljaca has left Ros Casares to join her former team-mate at Villeneuve d'Ascq Geraldine Robert in Italy with Liomatic Umbertide.